Cruise International magazine is the UK’s only newsstand travel magazine dedicated to cruise holidays. Buy a single copy or subscription to Cruise International magazine. Packed with inspirational reviews, the hottest destination advice, celebrity interviews and the very latest ocean and river cruise news, it helps both new and experienced cruisers plan their next trip. 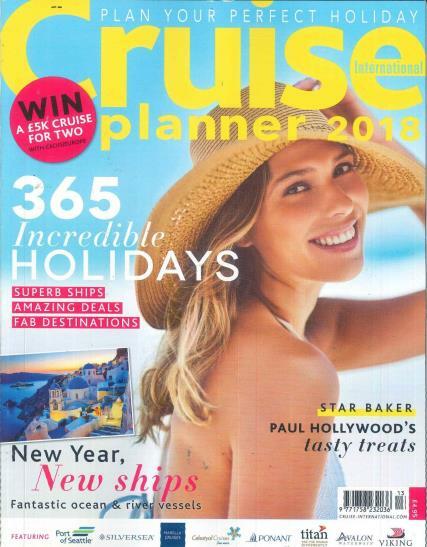 With high production values, stunning photography and outstanding editorial, Cruise International magazine is first choice for Britain’s 1.75 million annual cruise holidaymakers. Whether you’re planning your very first cruise or have cruised before, Cruise International, the independent cruise magazine for cruise holidaymakers is the only guide you need for planning that holiday of a lifetime. Cruise International provides all the information that you need from choosing the perfect destination for your cruise, to guidance on choosing ships, to expert advice about life on board. Information on new ships and new destinations ensures that you are always kept up to date with Cruise International. Packed full of stunning photographs of the ships themselves to the glorious destinations you could visit, Cruise International is your ultimate companion for your cruise holiday. ‘Where to find Winter Sun’ Cruise International’s guide to escaping the British Winter Cruise International’s August/September 2010 issue presents readers with the ultimate guide to where to find winter sun. If you’re looking to escape the cold with a winter break, Cruise International’s Amy Watkins reveals this season’s ‘hippest winter hotspots’. Amy Watkins writes, ‘In the midst of Britain’s colder winter months, the thought of even a glimpse of sunshine is enough to get most of us on board the nearest plane to somewhere hot and sunny’. Profiling eight fabulous destinations for your winter get away; Cruise International will have you spoilt for choice when choosing your destination. The Caribbean, the Middle East, North Africa, West Africa, Australia, South American, South East Asia, The Far East, Europe and the Atlantic Islands all feature, so there really is a perfect place for everyone. Each profile presents all the essential information that you need in order to choose the perfect destination for your cruise holiday, providing details such as the traditional places to visit to more undiscovered locations, the best time to travel to the particular destinations and the cruise operators available. Elsewhere in Cruise International, there is a guide to travelling to Dubai, the second largest of the seven United Arab Emirates; there is an interview with Sian Lloyd, the Welsh TV weather presenter who uncovers her love of cruising and there is a commentary on Yachts of Seabourn’s latest luxury vessel, Soujourn. After just finishing the magazine recently, I highly reccomend it and would seriously advise anybody with an interest in cruises, or anyone even just considering their options for a holiday, to make sure the next copy doesn't pass them by.